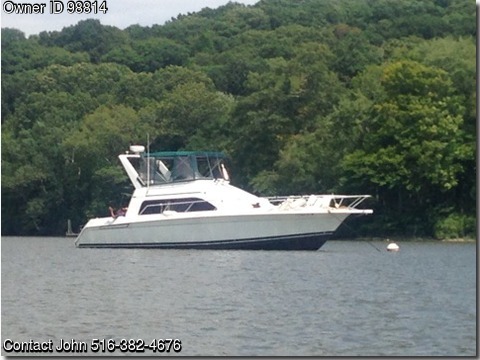 Please contact owner John at 516-382-4676. Boat is located in Old Saybrook, Connecticut. This Mainship 40 Sedan Bridge is the perfect boat for anybody. It features two 300 hp Yanmar diesels with very low hours and are meticulously maintained. The boat also has a 9KW Kohler generator with only 100 hours. This boat is maintained to the highest standards. The Mainship 40 Sedan Bridge can comfortably accommodate 4 in two staterooms as well as another two in the pull out couch and fold-down table in the dinette. The boat has had many changes to it such as new carpeting and a new couch. In the salon, there is a large couch to starboard and the dinette and galley to port. There are two ACHeat units in the boat. The galley has a large refrigerator, bigger than most. The outdoor space on the Mainship 40 is great. A large cockpit is great for entertaining with built in seats to port and starboard. The flybridge is large with plenty of room for people to sit as well as new helm seats. Access to the flybridge is safe and easy with molded in stairs. There is also access to the bow from the flybridge, another great feature many boats do not have. This boat is equipped with a Raytheon radar, two Garmin chartplotters, a standard horizon VHF, and a depthfinder. There have been many upgrades to this boat and it has been well cared for for all of her life.